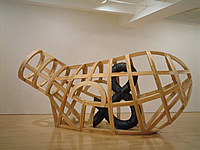 This exhibition by the American artist Martin Puryear presents some 15 works focusing on large-scale sculpture from 1997 – 2001 and large limited edition prints from 2001 and 2002. With an emphasis on process and materials, Puryear uses traditional craft-based techniques, such as those used in woodworking, furniture making, basketry and boat making. Working mainly in wood, he creates meticulous hand-crafted sculptures which are often painted or combined with man-made materials, such as wire or tar, to create organic objects that refer to recognisable objects, including vessels, huts and nets. His extensive knowledge of nature, wildlife, history and geography as well as an interest in Native American, African, Scandinavian, Japanese and Artic cultures have all been major influences on his work. This is the first large-scale showing of Puryear’s work in Ireland. This exhibition is shown in connection with BALTIC – The Centre for Contemporary Art, Gateshead. A catalogue, with an essay by Sune Nordgren, former Director, BALTIC, accompanies the exhibition.